Libero Rules specific to the libero position. The specialized defensive position is for the libero to playing defense and pass in serve receive. The libero may also serve in one rotation, but can only be in the set in the back row. The libero doesn't sub into the game... it's called libero replacements. A team has unlimited number of libero replacements. The big thing is the player the libero replaces must be the same player that replaces the libero. A common mistake teams make is trying to replace the libero with a different player when wanting a different player in the position (for example, when the libero rotates to the front row). When the team rotates and the libero is now on the front row, the libero must be replaced because the libero can't play across the front. 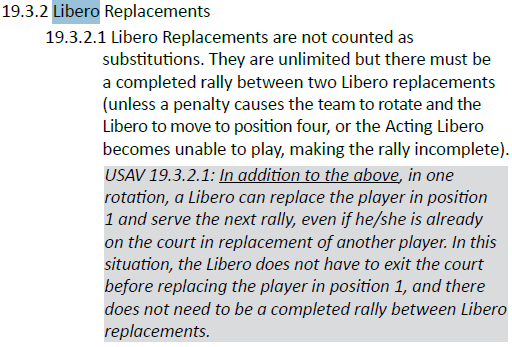 When being replaced, the libero must be out of the game for one rally. This means the libero can't stay in the game the entire time. The libero must come out for one play. The exception to this rule is for when it's the libero turn to serve. The libero can serve in one position (one spot in the serving order). For this situation, if the libero is in the game for another player, when it's the libero turn to serve, the libero goes straight back to the serving spot without coming out of the game. 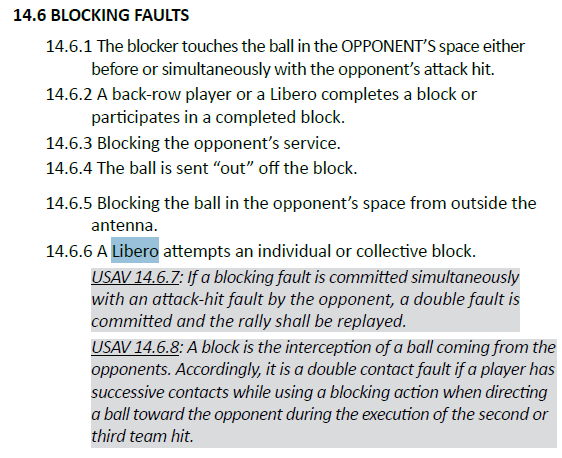 In USAV, there is an option to use two liberos. At the beginning of the match, the coach must decide if the team is going to use two liberos or one libero or none. 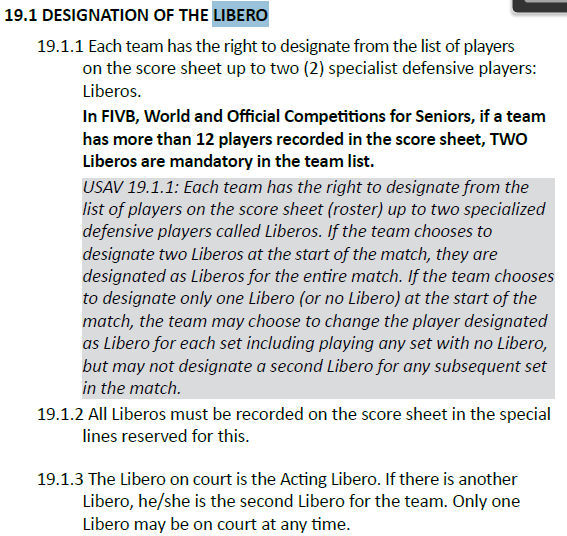 If the coach wants to use two liberos, then the two liberos are determined for the first set and must be the liberos for the remainded of the match. 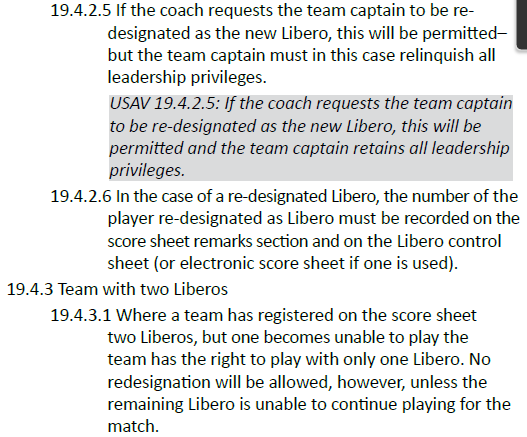 So, when deciding to use two, the team must only use those two for liberos... no other players can play libero for that match (unless there is an injury). If choosing to use no libero or one libero, then the coach can using a different libero for the second or third set. 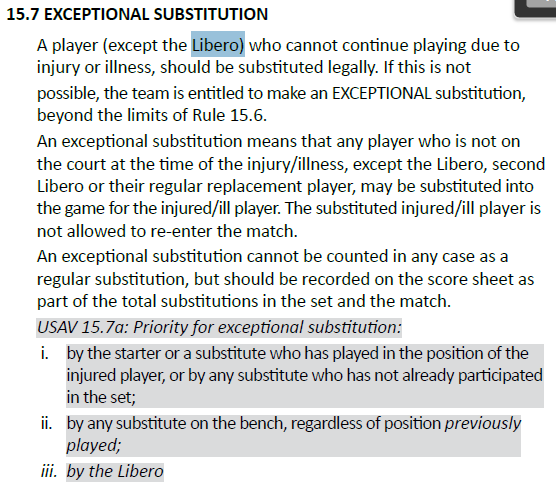 So basically, designate two liberos for the entire match. 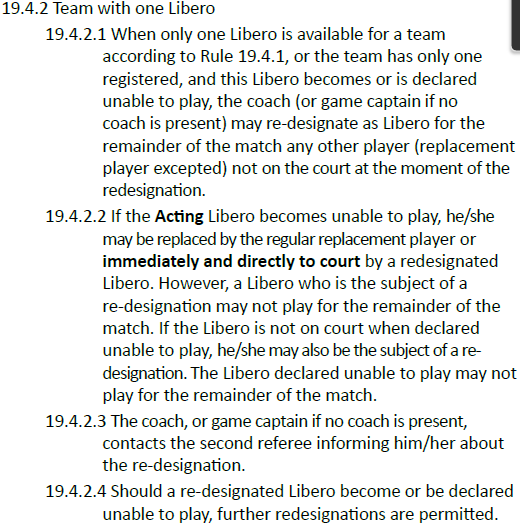 When designating one or none libero, the coach can select a libero for subsequent sets of the match.